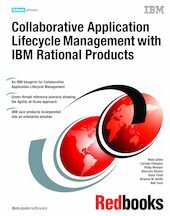 In this book, we provide a reference scenario and tool architectures for deploying the new IBM Rational products into an existing enterprise environment. We also provide a set of blueprints that define each of the key disciplines in the development life cycle to help you understand the domain and how the Rational products support the need of that discipline. Our primary focus is to highlight the value of CALM by providing a user view of the solution that is used to support a distributed enterprise development team that incorporates aspects of the "Agility-at-Scale" approach. While most Redbooks publications provide details about a single product, this book provides a "green-thread" reference scenario that details one end-to-end path through an iteration of a software development project. The scenario demonstrates a reference architecture for an enterprise that uses the new Rational Jazz technology-based products along with the existing Rational team products. The scenario includes Rational Build Forge® Enterprise Edition, Rational ClearCase®, Rational ClearQuest®, and Rational RequisitePro®, and introduces Rational Quality Manager, Rational Requirements Composer, Rational Software Analyzer, and Rational Team Concert.